ODABAN® Foot and Shoe Powder will leave the feet and footwear odour free for up to six months. Foot and shoe care was never easier. Using the teaspoon provided, sprinkle one spoonful of powder into both shoes each day for seven consecutive days or until the powder is used up. Your feet and footwear will now be odour free for up to six months. Any other footwear, worn intermittently, should be treated each time they are worn until the powder is used up. Let your feet breathe again! Newly secreted sweat does not smell, it is only when the bacteria on the skin and footwear breakdown the various skin secretions that the familiar unpleasant “smelly feet” odour become apparent. ODABAN® Foot and Shoe Powder works in two ways; by absorbing perspiration, the powder initially helps reduce the multiplication of the troublesome bacteria by creating a drier habitat and the strong bactericidal properties of the natural ingredients then kill off the remaining bacteria. Regular applications of the shoe powder eventually remove all the bacteria leaving a residual bactericidal level that helps keep the feet and footwear smelling fresh for months. ODABAN – foot and shoe powder only removes harmful bacteria it does not impair the body’s natural skin protection. 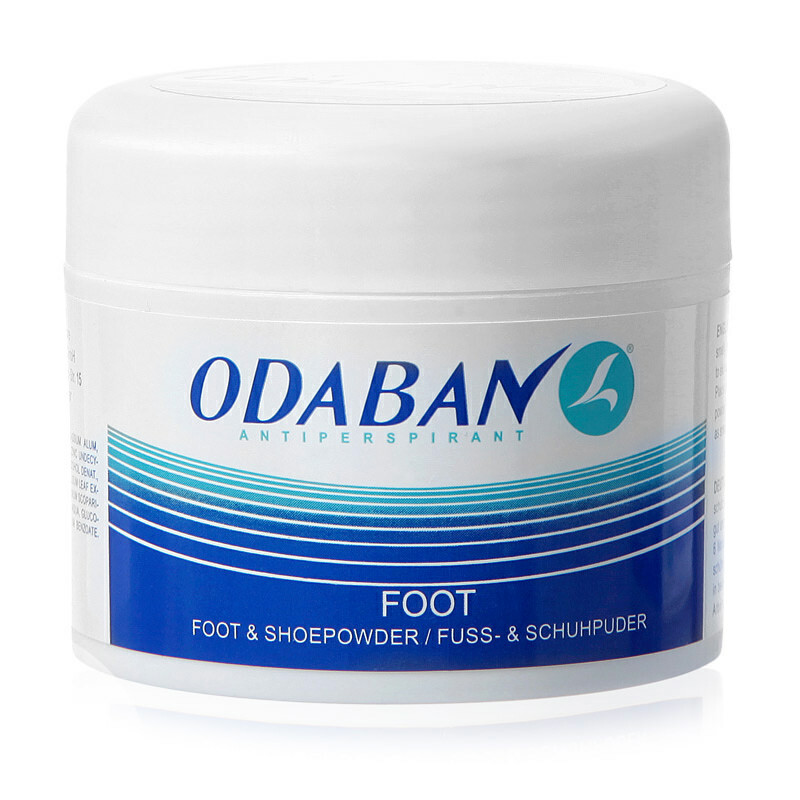 Odaban Foot Powder is available to buy online now.